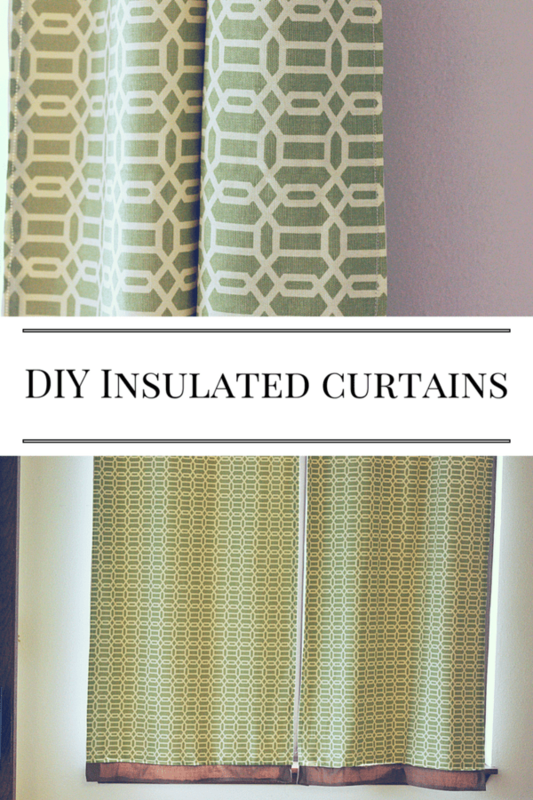 DIY insulated curtains can be yours in under an hour. For reals. 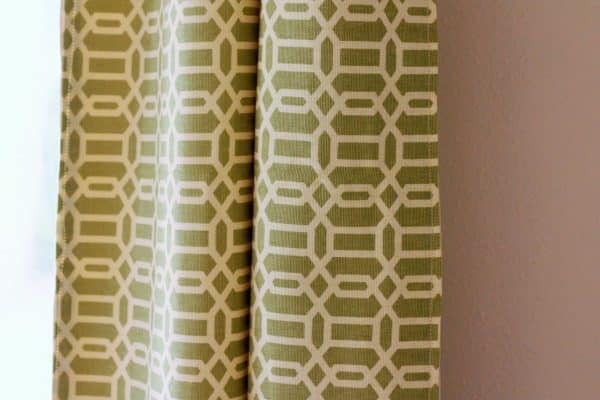 Please keep in mind that I am a total novice when it comes to sewing, so if I can make these DIY insulated curtains- you can make these DIY insulated curtains. There is a small window off of our kitchen that faces southwest and lets in so much sun during the summer. It’s also above the garage, and we lose a lot of heat during the winter. The window was covered with some dingy metal mini blinds, and I had my sights set on insulated curtains for that window. 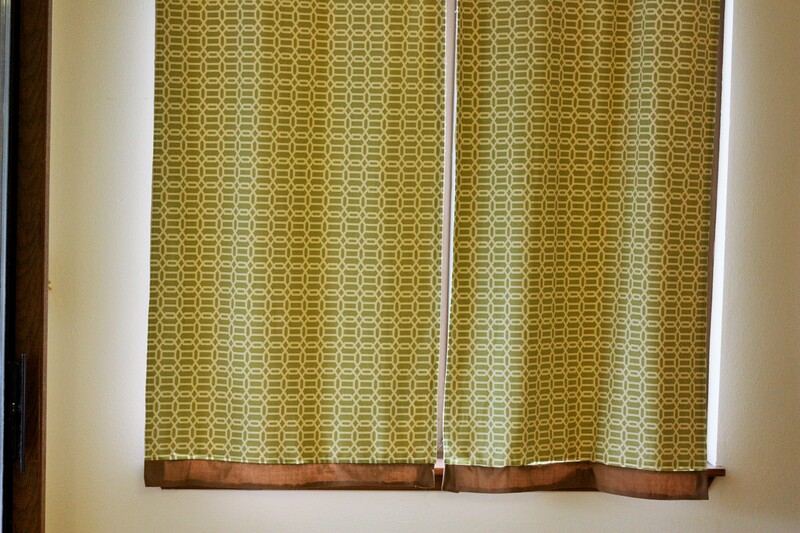 Because the window is so small, I didn’t want to spend money on new curtains – hence the DIY insulated curtains. We had two sets of old ugly/boring curtains from our last apartment. One set were plain brown panels, and the other set was beige. Just looking at them put me to sleep. I found some “sassier” fabric that I loved for 30% off at JoAnn’s, and then I had a 20% total purchase coupon. My “fun” fabric cost me $4.61. I cut the fabric to fit the size of the window, and then cut it in half vertically. 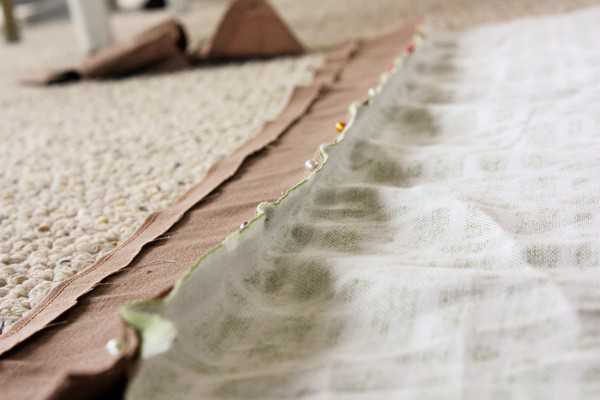 Then I sewed a simple 1/4 inch seam on the sides (long edges) of each panel. After measuring the top and bottom of the panels, I cut four three inch wide strips from my ugly brown curtain, and then pinned them for a 1/4 inch seam. Then I sewed the seam. 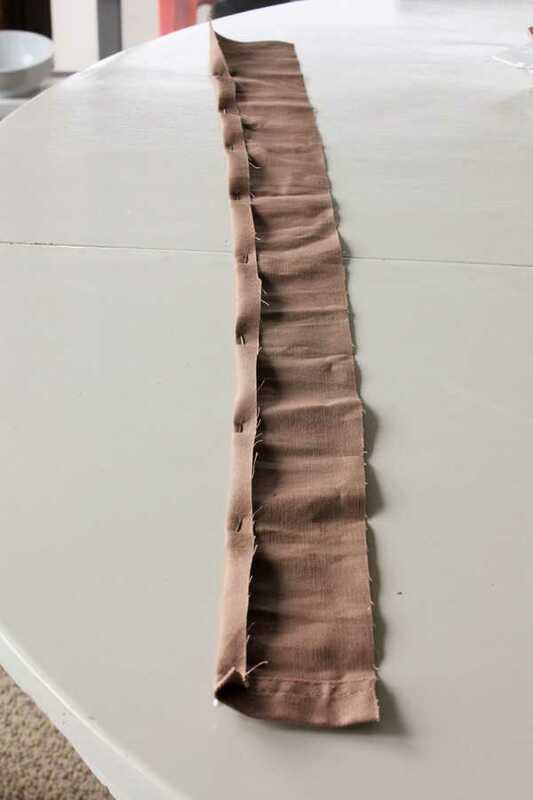 I pinned the “pretty sides” of the fabric together and made a 1/4 inch seam to connect the brown strips to the top and bottom of my fun fabric. At this point, I stopped taking pictures because I was trying to beat the clock of Jack’s nap time. Then I cut and sewed the old insulated curtains on to the back of the new panel. We used the curtain rings we had for the old set of curtains, and then Troy hung a small bar up that I got on clearance at Joann’s. These curtains have made a big difference in terms of heat loss. I’m looking forward to their heat blocking tendencies during the summer. DIY insulated curtains for the win! In hindsight, I would have made each panel about 2 inches wider. Also, I would have never cut bangs my junior year of high school. 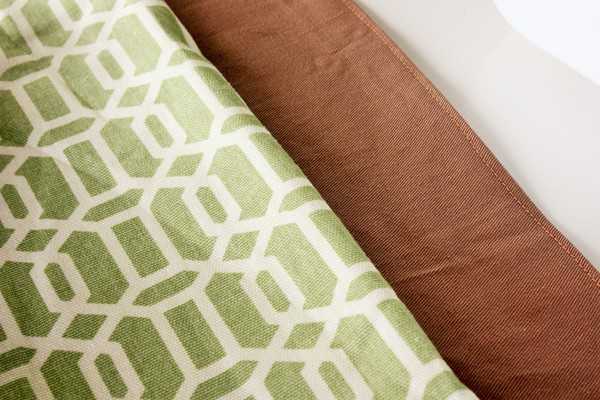 These DIY insulated curtains were created during one nap time. 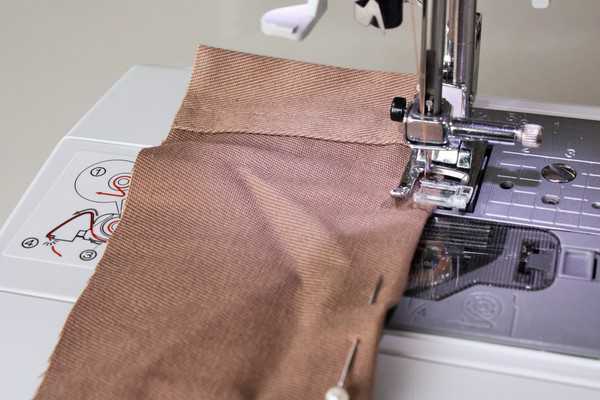 They are a great project for a novice sewer or a super simple project for an experienced seamstress. Edited July 2017: check out this other set of DIY insulated curtains I made for the same window a few years later. That picture doesn’t do them justice, they are even cuter in person! Good job on controlling heat! From a master at sewing–next time don’t make two panels. One panel works better for your problem. If you get some magnets or velcro, you can make them snug up to the window better. Even sewing washers to all bottom edges would help. In order to avoid center gappiness on my back door curtain, I made it one gathered panel. It helps with privacy and I can always pull back the panel from the side. Same thing for a huge window curtain in the kitchen. It is all one panel and two windows wide. I would have to crawl behind the table to access the opening between two panels. As it is, I only need to pull back the side of the curtain when I want to look out. The kitchen curtain would never be opened anyway. It is unconventional, but it works. I’ve noticed Amish houses with this style curtaining. Just full pieces pulled to one side. Makes sense, and I like the look of it too 🙂 I can’t wait to make some! You can also buy a fabric at JoAnns called Economy Blackout. Use a 50% off coupon, makes it less than $5 per yard. It is the same stuff that is in the heat blocking curtains you can buy. 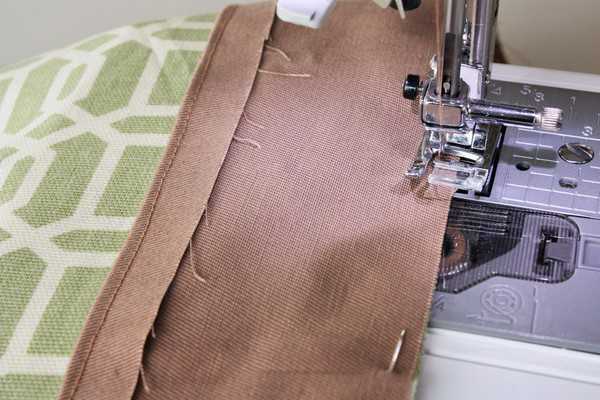 It isn’t hard to work with, and even makes a good water resistant matress cover or lap pad (if you have a baby or small child). Using this to line your curtains helps a lot.